Looking for an underwater physics based app for your iPhone or iPod touch? 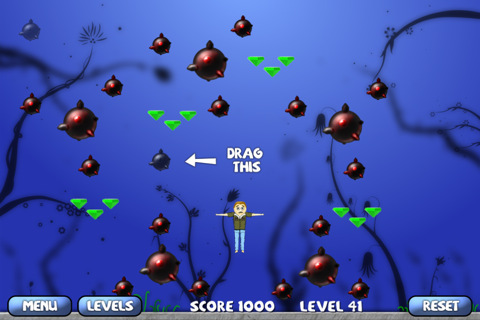 In The Flood: Salvation by CloudGears, your objective is to bring Joe up towards the surface. Helpless Joe is trapped under water. You have until his oxygen runs out, or until he runs into saws and lasers and dies. You are given some items, and it is up to you how you place them. 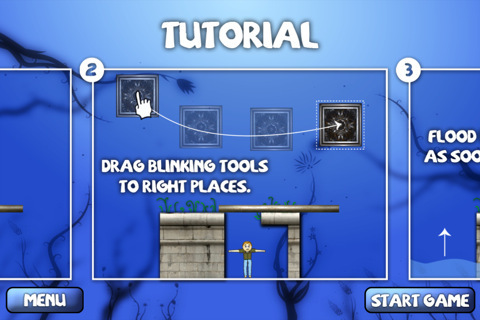 What makes this game more unique than the next iPhone puzzle game is that you must think outside the box while using a bit of physics using Joe’s rag-doll effects. The Flood is the type of puzzler that can’t be solved by one specific way. Because of the ragdoll effects that are implemented on Joe, you will be spending a lot of time figuring out what to do and what to avoid doing. Playing The Flood requires a lot of trial and error rather than just speeding run through the whole thing, which makes the game is hard. The first level is simple, but from then on it gets almost impossible. With close to no helpful clues at all you can be stuck on a single stage for hours until accidently doing something right. The help button tells you where you can place an item, but it doesn’t tell you what item. With only an outline of a square, the hint can end up frustrating you more than helping you. Another thing I found cumbersome was the order of items you use. You are given x amount of items, but you can’t use whichever one you want first. You must first use the previous item and then the next. Finally, and this is probably a bug that can be easily fixed but, Flood doesn’t use the full screen’s touch screen abilities. You can’t use the bottom cm of the screen which really kills accuracy for item placement. So what is my final verdict? If you’re into challenging puzzle games, this would be a game for you. But if you’re the type that likes to skim through games quickly, stay away from this one. For the price of $1.99 it isn’t that bad. There is also a lite version you can try out. Sample the free version of The Flood: Salvation on your iPhone. AppSafari review of The Flood: Salvation was written by Vincent Tam on April 12th, 2011 and categorized under App Store, Games, Physics Based, Puzzler, Resource Management. Page viewed 3244 times, 2 so far today. Need help on using these apps? Please read the Help Page.